Supporting the collective revenue growth of franchisees across the group supports group revenue growth. 51% of group revenue. Keeping the franchise model agile and responsive to changing market conditions supports franchisee profitability. This ensures the sustainability of their businesses and keeps the group’s brands attractive to potential franchisees. Ensuring they have the necessary skills and capital to succeed. Identifying and securing suitable sites that align with the brands’ target markets. Given that occupancy cost is a significant expense and above-inflation increases rapidly erode profitability. It is imperative that sites attract sufficient foot traffic to support feasible restaurants. Refining restaurant designs to reduce set-up costs, improve kitchen efficiencies, make effective use of space, and introduce sustainable technologies. Helping them to manage their businesses efficiently and sustainably. Identifying marketing opportunities and aiding the development and implementation of bespoke marketing plans for each restaurant. Upholding brand and product standards through regular inspections and assessments against group operational standards. Frequently reviewing and adapting the franchise model to support franchisee profitability. Strengthening customer engagement through loyalty programmes. Providing training to franchisee employees to ensure high standards of food quality and service. Supporting consistent food supply, excellent quality and competitive prices through the group’s centralised procurement strategy. Group restaurant designs include smaller format stores that reduce set-up and operating costs, and are better suited to smaller urban areas. These include smaller format Spur outlets and Spur Grill & Go, located in high foot-traffic sites. The group opened three Spur Grill & Go outlets locally, and one internationally, during 2017. Standardisation supports the ability of franchisees to maintain the consistently high standards required by the group. Standardisation of restaurant design and specifications across each brand ensures consistency across operations in terms of buildings, kitchens, service, food offerings and customer experience. Regular revamps and refurbishments upgrade restaurants to keep them fresh and appealing to customers and have a direct impact on franchisee turnover. Franchisees invested more than R32 million on revamps and relocations during 2018. New restaurant designs and equipment specifications support franchisee profitability by improving food preparation efficiency and reducing energy and labour costs. Group restaurant designs include smaller format restaurants that reduce set-up and operating costs and are better suited to smaller urban areas. These include smaller format Spur and Panarottis outlets and the Spur Grill & Go format, which is suited to high foot-traffic sites. 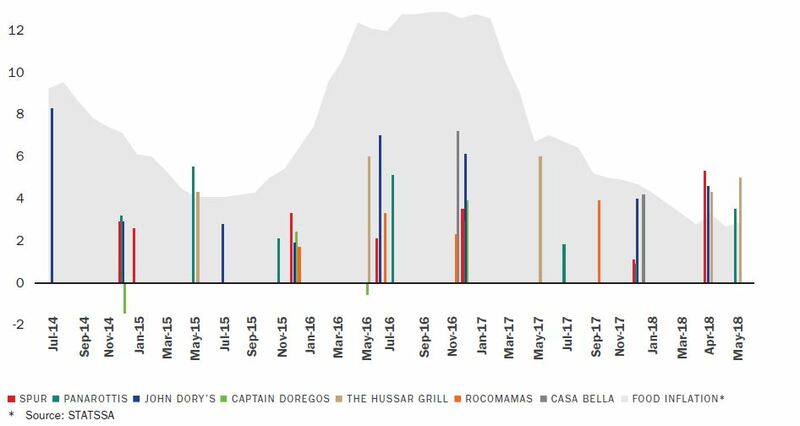 The increases in costs of occupation (including rent, landlord operating costs, rates and utilities) has resulted in careful consideration of the size of all new restaurants, with focus on maximising trading densities. The installation of kids’ play areas in Spur, Panarottis and John Dory’s provides for an exciting family entertainment destination. Operational inspections include an assessment of restaurant facilities to ensure that these continue to meet the required standards. Menus across the brands are continually assessed and refined to ensure that they address customers’ taste profiles, balancing “customer favourites” with the latest food trends. In the context of rapidly rising food costs and a highly competitive food retail sector, promotions are an important mechanism to attract customers and support franchisee revenues. While promotions must be priced competitively to appeal to consumers, this must be balanced against the need to support franchisee profitability. In an environment of high food inflation, increased competition and financial pressure on consumers, ongoing menu engineering supports margins by optimising sales mix and product range, thus reducing wastage, controlling food costs and reducing labour costs. This improves process efficiencies and enhances the appeal of brands to their target markets.